Lake Country’s pioneer resident Rosemary Carter has been awarded the Distinguished Community Service Award by the Central Okanagan Heritage Society. 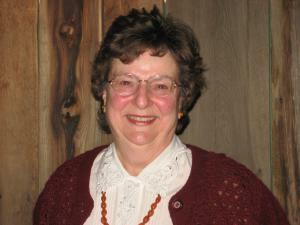 Rosemary has made extensive contributions to heritage throughout the Central Okanagan. 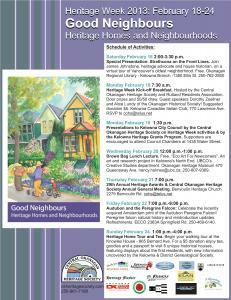 The award ceremony will be held on February 21, 2013, at 7 p.m. at the Benvoulin Heritage Church in Kelowna. The Lake Country Museum, housed in the former Okanagan Centre School, served the community from the early 1930s to 1984. Rosemary attended that school and has been associated with it since then. When the school closed in 1984 the Lake Country Heritage and Cultural Society (LCHCS) was formed and Rosemary was one of the founding members who petitioned the School District to preserve the building. The Lake Country Museum opened in the school building in 1985 and Rosemary has been an active volunteer and member of the Board of Directors of the Society since that time. She currently sits on the Lecture Series Committee but is active in all Museum activities. She donates a large number of volunteer hours each year, working with Curator Dan Bruce to maintain the buildings and collections. She has also donated a large number of family artifacts to the Museum collection. One of the Museum’s highlights, an historic cabin built in 1906, belonged to Rosemary’s family and for many years was maintained by Rosemary and Ron Carter on its original site. In 1998, Rosemary and Ron donated the Wentworth Cabin to the LCHCS to be enjoyed by the public. The cabin was relocated to the Museum property, conserved in its original (vernacular) design and is furnished in period style. Rosemary remains very involved in its maintenance and operation. Rosemary also volunteers many hours working with the Regional District of the Central Okanagan (RDCO) to preserve and maintain Gibson House at Kopje Park. This heritage building was built for George Gibson, Rosemary’s grandfather, in 1913. The RDCO purchased the property in 1987 and with assistance from Gibson’s daughter, Joan Shaw, and grandchildren, Rosemary Carter and Mick Wentworth, refurbished the house, working from photographs and using period furniture. The house has now been entirely restored and refurnished by community donations and grants. In 2012, Gibson House celebrated its 100th anniversary. 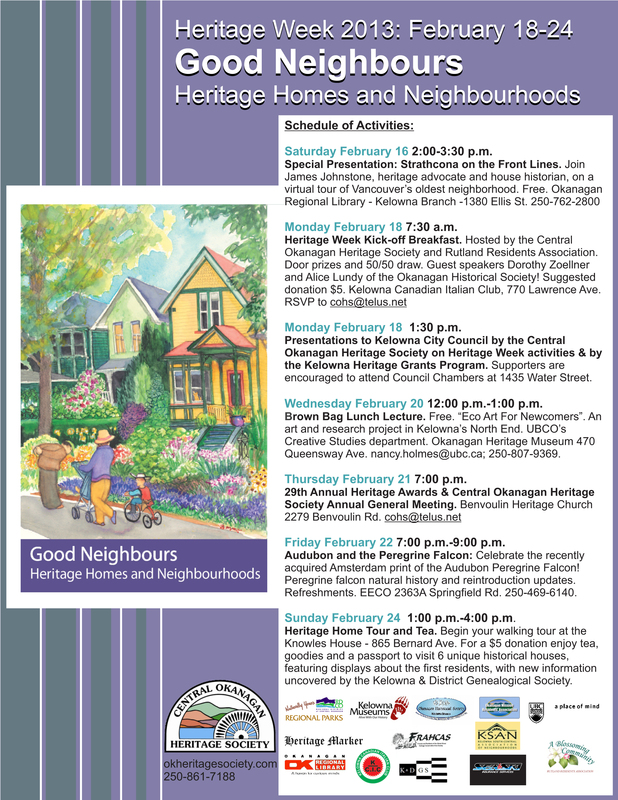 2013 Heritage Week activities. Double click to enlarge. This is a wonderful way to acknowledge persons like yourself Rosemary. As a (relatively speaking) “newcomer” to Lake Country, I truly understand and appreciate the contributions made to a district which I have grown to love and which, please God, will always be my home. Lake Country Heritage and Cultural Society is so very pleased to have one of our hard-working volunteers recognized by being awarded the Distinguished Community Service Award by the Central Okanagan Heritage Society. Rosemary Carter has volunteered with many organizations in Lake Country over many years and contributed enormously to her community. Our very best wishes Rosemary.